Kristine Nielsen, Jean Lichty, Annette O’Toole. A Lovely Sunday for Creve Coeur is one of Tennessee Williams' later plays and not often produced although it is another example of Williams' beauty of language, his grace and search for human sensitivity and endurance. 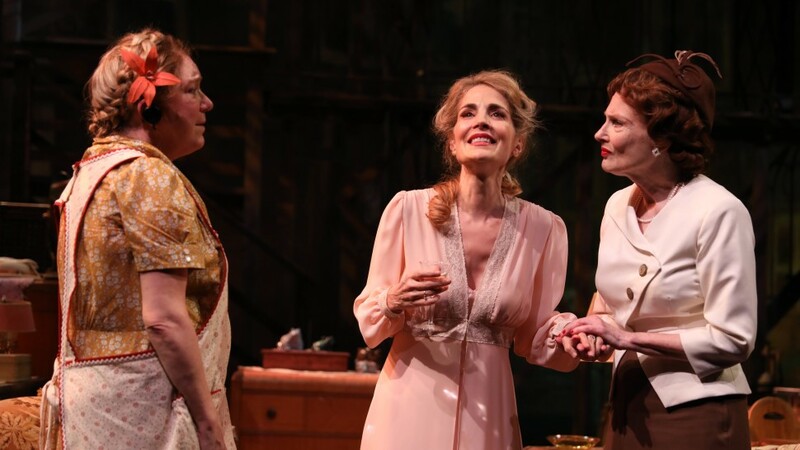 At the Theater at St. Clements, La Femme Theater Productions explores how four single women, on one Sunday in Depression-era St. Louis, battle against human loneliness reminiscent of previous Williams' literary ladies like Blanche, Amanda and Laura. It is essential Tennessee Williams, touching, delicate and earthy. Williams focuses here on two female roommates, the support and the tensions between them, their individual yearnings as they live in a cluttered efficiency apartment in the mid-'30's. Bodey Bodenhafer, older, down-to-earth and affably sloppy but vain enough to try hiding her hearing aid with an floppy artificial flower. Bodey has long abandoned any romantic dreams of her own. She works at International Shoe, shops at the Piggly-Wiggly and takes care of an overstuffed apartment that was designed by Harry Feiner to look as if it contains every knickknack Bodey ever ran across. In a beautifully layered performance by Kristin Nielsen, Bodey is the standout among the other women, ready to step in with a cup of coffee, words of support, and throwing away a newspaper posting of a hurtful item that might reveal a sharp turn in one woman's life. As the play gets going, she is frying chicken and making deviled eggs for the Sunday picnic at Creve Coeur Lake with her twin brother, Buddy and hopefully, her roommate, Dotty. Dorothea Gallaway ("Dotty"), portrayed by Jean Lichty, is younger than Bodey, a wispy-voiced, pretty, fanaticizing Southern belle who dresses too young as she faces the dreaded old-maid years looming closer. A high-school civics teacher, she bases her salvation on marriage, hopefully with Ralph Ellis, the smooth high school principal she has been secretly dating. Now, as she does her morning "setting up exercises", Dotty waits for the phone to ring. (Unlike The Glass Menagerie, this "gentleman caller" will call via telephone). Dotty is sure he is about to propose marriage, admitting to Bodey that on a recent rainy night, after one Pink Lady, she did not "hold the line with him." Bodey is shocked. She is hoping that Dotty might marry Buddy, Bodey's beer-guzzling, overweight brother, a thought that horrifies Dotty who always insists, “To me...romance is essential." Clueless, Bodey still decides not to share Dotty's fall from grace with Buddy. Living upstairs is Miss Gluck, a severely depressed middle-aged woman whose aged mother recently died. Miss Gluck only speaks German and appears at Bodey's apartment intermittently, in the midst of any chaotic moment, overcome with sobs and seeking comfort with crullers and coffee. She provides an overly histrionic ethnic touch reminiscent of The Rose Tattoo, but actress Polly McKie can make inconsolable tears hilarious, especially with surprising comic moments. Finally, Helena (Annette OToole), with pretentious arrogance, arrives to see Dotty, a co-worker at the same school. Helena, standing apart from the other women, is dressed by designer Beth Goldenberg, compared to the flouncy dress for Dotty. Helena makes sure she expresses her opinions, all disparaging. She scorns Dotty's current living conditions, Bodey and especially Miss Gluck. Secretly, the two ladies have made plans to move into an new upscale apartment and now Helena has come for the rent. When Dotty realizes she cannot afford this expensive move, Helene is outraged. Revengeful, she searches for the morning newspaper with an announcement that shatters Dotty's dreams. Yet there is an ending of hope and compromise. Over the hours of one Sunday morning, Williams reveals his trademark understanding of loneliness and the needs of life for friendship, support and perhaps occasional accommodations. With poignancy is humor, the emotions combining with a gentle charm by four actors who understand and communicate William' sensitivities. In a smooth flow, director Austin Pendleton brings out the unique eccentricities of each woman, linking their individual delusions and anxieties with universal humanity. Running time: One hour, 40 min. No intermission.